The Mont-rebei gorge is a site located between the provinces of Huesca and Lleida (Spain), between the regions of Ribagorza and Pallars Jussà. 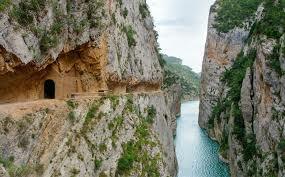 It is constituted in the narrowest part by which the river Noguera Ribagorzana, which forms the natural border between Huesca and Lerida, crosses the Montsec mountain range, walls in vertical fall of more than 500 meters and a width in its minimum point of twenty meters . The Catalan part is part of the Natural Reserve of the Noguera. It is within the Area of Natural Interest of the Sierra del Montsec.